Geotechnical drilling is a type of drilling that is performed as part of the construction process. This is mainly for structures such as buildings and oil rigs, or as part of the investigation process carried out on site prior to construction. This task is usually undertaken by drilling contractors who are qualified to operate specialised drilling equipment. It’s also under the supervision of a geotechnical engineer who oversees the process to ensure that the drilling meets the requirements of the project. Geotechnical drilling contractors sometimes provide other drilling services, depending on their size and location. The type of drilling equipment used to perform the work will depend upon the specific requirements of the project. Drilling rigs are the machines that are used to create holes in the ground. They vary in size and capabilities, ranging from massive structures that house equipment used to drill oil wells, to rigs that are small enough to be moved manually by one person, called augers. Mobile drilling rigs can be mounted on a truck, track or trailer, while the larger drilling rigs such as those used in offshore oil rigs are more permanent structures. A typical reason for geotechnical drilling is site analysis. Site analysis is performed to establish whether or not a site is going to be appropriate for construction. This involves drilling to collect rock and soil samples, as well as drilling to determine soil stability and other matters of interest. Site analysis is crucial for very big structures. Unsafe rock or soil conditions could trigger a structural collapse, or cause a hazardous scenario during an earthquake or flood. The law usually calls for a site to be investigated for safety before a building permit can be granted, and continued safety monitoring must take place to identify any changes or indications of developing problems that could pose a risk to the development. This requires drilling rigs and other drilling equipment to be deployed to the site to be used for the investigation. As part of the construction process, geotechnical drilling involves preparation for foundations, caissons, and various supports. This kind of drilling is supervised by an engineer who verifies the positioning of the drill and makes certain that the drilling is carried out correctly. Sinking a hole in the wrong spot or drilling incorrectly can cause problems which may result in delays. 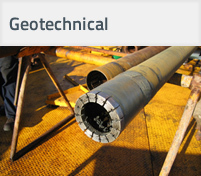 Geotechnical exploration conducted in the search for deposits of minerals, oil, gas, and other valuable resources in the Earth may also involve geotechnical drilling. In this instance, drilling contractors would be required to take core samples and obtain data about the site. It may also be used by scientific researchers who wish to discover more about our planet, and acquire samples such as ice cores in areas like the poles. Ice cores can provide an insight into the Earth's climate history, preserved neatly on ice for the convenience of scientists who are concerned with climate subjects. In this situation, geotechnical drilling might be performed by drilling contractors who specialise in scientific drilling applications, as opposed to drilling for construction.